Government is supposed to be a matter of unity- we all know that governments in the Western world are never unified, they are to quote Yes Minister a loose federation of warring tribes, and that politicians retain the pretence of unity even whilst hating each other in private. Just before he died, Manny Shinwell asked Ernie Bevin whether Herbert Morrison, another Labour politician, was his own worst enemy, the ailing Bevin's famous response 'Not while I'm alive he ain't'. The surly tone of the foreign secretary's words could have been echoed by many politicians down the years- but far more often politicians find themselves yoked together with ties of mutual respect sitting awkwardly with fierce disagreement about politics. This happens in democracies of course- but also in dictatorships and monarchies. Nowhere less did it happen than in Elizabethan England- at the heart of Elizabeth's government, her ministers violently disagreed with each other and most importantly with the monarch. The key figure in all these disagreements was the Secretary of State William Cecil. Cecil was appointed in 1558 to become Elizabeth's secretary of state- essentially her eyes and ears throughout government. He read every piece of paper that crossed her desk and filtered out much of it that he did not wish her to see. Cecil had two objectives as Elizabeth's first minister. The first objective was to cement to the Reformation within England- in 1558-9 Cecil put together a strategy which repealed all the Catholic legislation of Mary (Elizabeth's predecessor, and half sister) and recreated the Church of England. In doing this Cecil worked against both Parliament and his mistress- he found ways to manipulate the vote in the Marian House of Lords and pushed for a more radical religious policy through his allies in the Commons- most notably a name that shall reappear here Thomas Norton. Secondly Cecil desired that the queen marry and produce an heir. Cecil saw the world in 1559 as resting on a thread- should Elizabeth die her half cousin, Mary Stuart, the Queen of Scotland and France would replace her on the English throne. Without an heir the life of the realm stood imperilled should Elizabeth die. The modern historical imagination lauds the virgin queen- had she died though before Mary, she would have plunged England into catholic rule again, like her half sister's reign, the reign of Elizabeth would be a footnote on England's Catholic history. Cecil understood this- and attempted again through Parliament to get Elizabeth to marry- in the 1562 and 1566 sessions, Elizabeth was confronted by bills drafted by her secretary (she did not know this) that questioned her private life and challenged her to find a husband and produce an heir- a Protestant succession. In doing this Cecil made use of Parliament. Effectively by the 1560s Cecil had begun to craft a constitutional doctrine that placed Parliament at the centre of Elizabethan politics. He argued essentially that should Elizabeth die the people represented in Parliament should rebel against a Catholic heir. Anticipating the Bond of Association of 1585, Cecil believed that Mary's succession would be so disastrous as to prompt civil war. Anticipating the Glorious Revolution, Cecil argued that it was up to Parliament to guarentee the Protestant succession and find a candidate who could be trusted on religion. Alford doesn't mention this- but this whole strategy makes me wonder whether Cecil was as against Lady Jane Grey as he publically professed to be. 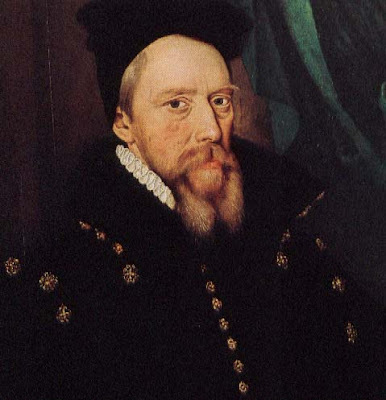 Cecil manipulated both Elizabeth and the public against Mary Stuart- there can be no doubt that when Mary fled Scotland in 1567, Cecil was involved in producing a set of forgeries- the Casket Letters- which suggested that Mary had killed her second husband Lord Darnley at Kirk o'Field. Cecil's skilful manipulation left Elizabeth in no position to talk to Mary, the murderess, despite the fact that tempramentally Elizabeth believed in the trade unionism of monarchs and the importance of legitimacy more than in the Protestant global reformation. Elizabeth because of the Casket Letters, was unable to support Mary's restoration in Scotland and therefore left Scotland in the Protestant world. For Cecil this was a triumph- from the 1560s onwards he had desired that Britain be united under the faith of Protestantism. From the 1560s Cecil had had a British strategy. I used to ask students at Cambridge to assess in essays whether they believed that Britain was a Protestant concept- whether one could be British and Catholic- for William Cecil the answer was obvious, he sought to forge a nation united under the faith of the living God. He sought to wield nationalism as an answer to the might of Spain and France. From the first days of Elizabeth's reign, Cecil saw the world as a battleground between Popery and Protestantism, between Babylon and Jerusalem. His Queen did not see things the same way- and Cecil came close on several occasions to resignation when she refused to bend her policy to his will- but equally he subverted her wishes, fed her false information and used the House of Commons as an instrument to wage a propaganda war against his own sovereign. Historians used to see the Elizabethan age as the beggining of the revolt of Parliament against the monarchy- but like in the age of Henry VIII, in truth Parliament gained power as it was used by figures within the court. Henry had used it to cement the English Reformation- Cecil used it to put pressure on the queen to protect that reformation. Cecil of course did not always succeed. He found in the Queen an opponent of comparable skill. Elizabeth was an amazing manager of men- she like Cecil had survived her sister's reign. She had passed within a hair's breadth of death in the Tower. She understood that naming an heir would be the end of her own reign- it would create an interest within the state that would be hard to control. The Queen preferred inactivity to activity- she knew the weakness of her throne and ultimately the weakness of her position. She also was a more conservative religious figure than Cecil- far more atuned to the evangelicism of her step mother Catherine Parr than the militant Protestantism of Edward VI's reign. Elizabeth came under repeated pressure from her councillers- men like Edmund Grindall (Bishop of London then Archbishop of Canterbury) and managed to frustrate them. She lost battles like that over Mary but Cecil was often reduced to frustration by his mistress's refusal to see the world as he saw it. The history of Cecil's career at the top of Elizabethan politics, is the history of his attempts to manipulate his queen to as to make his two loyalties the same. The preservation of the Protestant interest in Britain was the chief aim, Elizabeth the chief instrument and ultimately Parliament, the courts, information before him and even the threat of resignation the ways that he manipulated his monarch into supporting his policies. The great partnership was one filled with strife where two of the cleverest individuals of their age battled for their entire lives to twist each other's great talents to the service of legitimacy and international Protestantism. Mr Secretary Cecil was one of them- the Queen the other. How do you rate Martin Hume's "The Great Lord Burghley" (1898)? I haven't read it unfortunately- but from the date it'd strike me to be quite dated. It got a reasonable review from Pollard but he commented that it was mainly foreign policy focussed. Excellent - now Walsingham please. Excellent posts Gracchi. Very interesting analysis.